A sheet of mottled silver slid through the barren, ivory world. Skin clung against bone, looking for the nourishment that clearly wasn't there. The hot-blooded mare's body was not built for Frostfall in the wilderness, and her overly lithe form made it obvious. Hers was a body made to run in the burning sun, not to trudge through heavy snows in the depths of empty forests. Dull saphire orbs fell lazily over the surroundings, each bony tree blending into the next, until the wood became just a pale blur in the girl's eyes. What couldn't be seen within them was the steady anger, a slow resentment fueled by a forgotten soul. She'd went from being a beloved friend and champion into a nobody. No one knew her in this land, and it seemed that every attempt to socialize had only met her with cold words. Every stallion she'd met either seemed to look at her with disapproval or end up running away. She'd even been attacked by another mare, a striped harlot, while running in the Olympic games. Even there she could not succeed, and was left behind to spend Frostfall alone like some infectious creature. She didn't see her own sleek beauty anymore, though it still lingered in the grace of her gaits and the quality of her breeding. The thoughts of her encounter in the Frostbreath Steppe were stewing in her ravaged mind. The unicorns who had spoken so rudely to her had been a wake up call, in their own way. What reason had they to treat a lady so disgracefully? Were the species she once thought mystical really just tainted? A nose left short, dabbling depressions in the snow as the body pushed it through, trailing pawprints on either side of the singular dotting. Beside it crescents turned into sunken gulches as the heavier body plowed through the pale seas, leaving a wake of ruined, white canyons. The dog and horse walked on. The black and white collie stopped abruptly, his head jerking up so quickly his nose was still mounded with snow and sent it flying like a diamond rain. With his folded ears cocked and tail erect he set his amber gaze to the horizon and burned holes into it with his intensity to know. Beside him the buttermilk stallion shuddered to his own halt. Like a machine powering down so his limbs slowed to a crawl until they ceased to work at all. Mechanical he must surely be as steam rolls off his body in faint wisps while he exhales smoke and flecks of fire. The black powder collected in the creases of his nose burns as his frustration churns like a maddening thing inside him. "What is it," he whispers to the dog, his voice a rich whine of impatience. He feels chilled to the bone with the snow up to his knees and the sun barely gracing his back in these deep woods. His heart is leaden for other reasons that coil even tighter, but these most obvious affronts have him clenching his jaw in this moment. The dog does not speak; he never does. He only throws a shoulder's look at the stallion that is his master and then moves off at a quicker pace. Ricochet heaves a grumble in response but settles into a high trot to follow the mutt all the same. It does not take long for the silver bullet cutting her path through the forest to be noticed. The taut lines on a worried face relax and tilt into a partial smile as his teal gaze graces her form, legs meanwhile continuing to bring him ever closer to her. She is a beautiful thing, he can tell even from afar that she has steady conformation, an attitude to her step, and most of all, an equine composition. He called out to her with a deep bugle in his rash excitement. Relenting on his pace as he got closer Ricochet sunk into a halt a stride or two ahead of her, the whole side of his body position at its side to her front. He bowed his neck to let his scar be as hidden as it could. He wore the marring with a mixture of shame and pride. Every twinge of pain it sent curling through his body was just another sharp reminder of his resolve - he would constantly improve until he arose victorious above all else and had conquered the world with the equine race. It was a heavy thing to wear. "Good day," he greeted casually, as if crossing an acquaintance rather than a stranger. All equine were family to him. Upon closer inspection he realized what he could not see from afar. Her muscles were a thin mold over her bones and there was a haunted expression in her eyes that troubled him. It sent a fracture in his lopsided grin, causing the ends of his lips to twitch with dissatisfaction. Fire curled from his nose as he blew a heavy gust of steam and anger. Black hairs whipped at his flanks and teeth clicked like bird feet on ice. The Incendiary raged. "This is unacceptable!" he suddenly bellowed, teal eyes rolling in a world of white as his head knocked on heaven. The dog at his side hunched down against the snow, tail wrapping against his nose as he feared the abrupt wrath of his keeper. Normally the mutt at least understood the cause of the rage, but there was no obvious target, not when an equine mare stood before him. "No equine should be made to this state," he snarled, at no one in particular, while his body continued to thrash periodically in the form of a striking leg or gnashing teeth. "No equine." The musk of stallion almost didn't reach her cold and poorly working nostrils. Somehow it winded it's way to them, setting her slightly sunken features to a more attentive state. The scent was quickly followed by an enthusiastic, masculine call. Icy orbs flicked up, just in time to catch the flash of gold and black fur before her. A male, brawny, fit, equine. Her eyes widened, dark lashes batting back against her face. He was about her height, though far stouter and well muscled, with brilliant turqoise eyes. Unfortunately, handsome stallions seemed so plentiful in this place, Bellatrix was hardly surprised at his luring presence. Another flash of fur, this time at the stranger's feet, sent her dancing a few step backwards. A small, patched canine stood obediently at the dunskin's side. It took her a few moments to realize that the creature was the stallion's pet. She had seen humans in her old land with such small canines, but they were loud, obnoxious things that would bite at your hooves if given the chance. After eyeing the dog for a moment longer, she let her gaze move back to the sandy buck. His polite greeting was almost shocking, considering the reception she'd gotten from most others in this place. "Hello, sir." Blue pools became more hooded, and she uttered a well mannered response with a dip of her ashen head. There was no reason to believe that this boy was any different than the rest. And in this weakened state, she would have no way of defending herself, should he desire to harm her. The dappled belle could only watch as the stranger looked her over with his aquamarine view. Suddenly, it seemed, he grew agitated. The boy's husky voice rose, hardened and angry. Startled, she whirled backwards a few more paces, nearly tripping over tired, clumsy limbs. The silver dame was about ready to turn tail and run as far as her failing body would take her, but the brute went on. Still he thrashed furiously, the rage clear in his tone and sculpted form. But his words intrigued her, and reluctantly, she stayed her hooves. Was this odd horse really angered by her thinned bodice? It didn't seem he was trying to charm her, but what other reason would he have to be so concerned? Carefully, she attempted to give him some explanation. "No one made me this way, sir. I lost my family, and I do not know anyone in this land. I have no reason to survive." The words were heavy on her tongue, yet they made perfect sense. It may have been the lack of nutrients that made her so forthcoming with a total stranger; it was as if her control over what she said had been loosening for sometime now. The obvious fright that scattered her hooves as equally as her fine features plummeted Ricochet's heart into his stomach. Or perhaps his throat, because it felt tight and obstructed as he tried to call out to her, wearily striding out after her, before stopping and pulling back, afraid to give chase lest she truly flee. Hunched up against himself as he brooded over his rash actions, hooded eyes lifted to meet her as she precariously neared once more. The interval had been seconds, but his heart beat with a renewed fervor that suggested she'd been gone for seasons. He could not bare to lose her to this cold in her condition, certainly not by his part. Her voice was a delicate patter of tongue on lip, the words and an easy flow of well groomed manners and kindness. He proffered her a sad smile, only too aware of the naivety in which she existed. He wrestled with the decision to shatter that ignorance and thrust her cruelly into the reality of the world, or to keep her safely secure in his shadow and youthfully innocent to the monstrosity of life. "I apologize for my actions. I did not mean to frighten you, I just lost my temper to see you so..." He exhaled with a tremble. He seemed defeated as he hung his head, mane sliding over his head as if to hide him. "You are deserving of splendor and health, yet you are made to lack. No equine should ever be in want, not so long as I live." It was a true passion that gave him voice, and a raw frustration at the lack of ability to accomplish such a dream. Eventually he promised her as much as himself. Her profession of lack of purpose wrecked his heart all the more. He stood not before a strange mare but a sister left beaten and bloody on his homestead. It grieved him in parts no less equal to the anger it gave him. With a shake of his head he rushed to close the gap between them, muzzle poking out to nudge beneath her chin and lift it high, as it should be held. His breath would be warm upon her, his touch gentle, though firm. "No no no my dear, you have every right to exist. You are beautiful and perfect and powerful. By birthright you are supreme to the others, precious equine that you are..." Ricochet's voice faded, too overwhelmed by the sorrow at seeing such a broken girl that should stand so proud. He felt the bite of his rage and he wished to instill it in her. "You should not wander these rat ways with your nose to the dirt. I know a flame burns in you still, and if not in you then the fire rages in me and I will ignite you!" Ricochet's tone held an urgency that seemed to imply she might die on the spot if she didn't combust, a strange idea in itself. "Do not let them beat you down! Do not let those unicorns and those pegasus take you. You are better than them, stronger than them, more rightful than them. YOU ARE EQUINE." The buckskin's anger fleeted as quickly as it had set in, though she felt the boy was a loose cannon of emotion. One moment he was furious, and the next he looked just a sorrowful as she'd felt coming into this land. Common sense told her to run away from such a strange, explosive stallion, but dark spindles stood defiantly in the snow. What good would it do her to run away? In the cold of Frostfall she'd likely die anyways, might as well be at the hooves of a handsome brute. At least her last vision could be something with some beauty. It was with shining pools that she took in his apology. He talked almost as though he knew her, had met her before; like someone who had reason to care for her. Why did he speak so passionately? Didn't he see that she was but a stranger to him, just a lone mare lost in this place? Half of her wanted him to leave her, not lift her hope that would be all too easily shattered. The other half wanted to believe every word he said, to let him take her away and bring her back to life. Confusion and pain wracked her brow as she gazed at the passionate stag. She wanted to question why she was deserving of anything. Maybe this was the Gods way of sending her strength. Was this tanned buck some sort of angel? A loud, wild angel? The silver doe held her nerves together, feebly, as he came closer. She inhaled quickly, almost a gasp, when he pushed her chin up into the air. Her dished muzzle drifted upwards at the pressure, too shaken and weak to defy him. If not for his words, she would not have understood what he meant by the gesture, but the point was made clear. He didn't like to see his own kind in such a poor state, and he seemed to recognize the careful ancestry the humans had instilled in her lineage, the stone elegance that had been driven into her blood. Ebon lashes batted, the rest of her body quite still, chin still resting high in the air, as it might have been when she was more than just a mare. The tawny stallion seemed determined to bring her old pride back to the surface. "Do not apologize to me, stranger. My nerve should be stronger than it is. I will try, if you will it so much." Icy pools gleamed with more vigor, infused with curiosity, and most of all, gratefulness. "I am Bellatrix. I was once a champion, in the land of my birth." Pride found her face, diluted by the wistful sadness of what had been. Shaking midnight tressed at the nostalgia, she continued with her gaze back on Ricochet. "What is you name? Are you guardian of the Equines in the world?" She shook like a dying leaf in autumn's breeze. He could only imagine what was racing through her head and what emotions pulled at her heart like the tide on a beach. Would she flee? Certainly he acted mad, he could not blame her should she try to escape him, though it would wound him. He would love her, as much as he loved any of his kind. He would tuck her close to his chest and he would storm the world for her rights and her luxuries. It was with such earnest that he cared that the feeling brought him more pain than any wound he'd sustained on the battlefield. It pounded like thousands of hooves running over his mind, setting him to pace in the hours of the night when he should rest. How could he rest when equines such as she wandered alone and in such a state? He grit his teeth, fighting against the anger that threatened to resurface. Thankfully she stayed, and she spoke, and with it her voice and her presence stilled whatever actions raged inside him. "I want you try because you will it," he whispered to her, but it was mostly a stray thought than a useful segment of conversation. Perhaps she wouldn't even have heard it. Her brightening features gave Ricochet a kinder warmth than his previous furious flame. It lent him a lopsided smile as he felt he could breath a sigh of relief when it was pride that rounded her cheeks and pinched at her eyes. He could rest easy knowing she was saved, for now. Could he bring her back to what she once was, what her vigor promised she could be? A champion she said, he curiously wondered of what. A light laugh, one that showed his boyish youth and playful energy, shuddered from his nose when she queried of him. "Something like that..." Ricochet mumbled, eyes sparkling with a secret. "I am Ricochet the Incendiary, of the Foothills herd. I have visions of a different life, a different herd, a different...empire, but circumstances grant me little control." Ricochet admitted with an aggravated sigh. 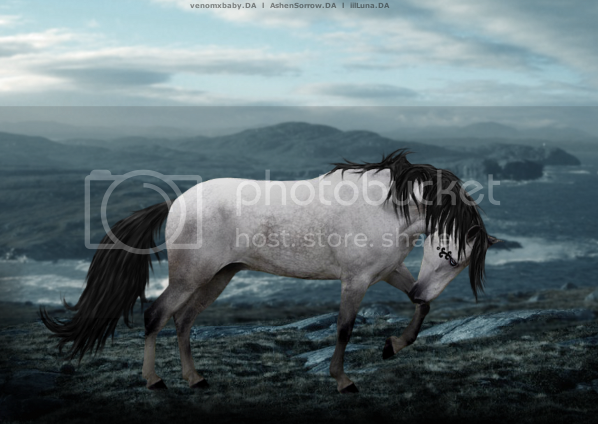 He shook his head, his mane sitting against his nape in a wearily disheveled manner that matched his stray thoughts. He glanced up at her after staring morosely at the ground for a moment. His gaze had hardened again, full of that previous ferocity when he'd first met her - was it only moments ago? It felt more like a life time. "For now." That seemed to end the topic of conversation as Ricochet turned his body, edging closer to her to offer her warmth as the winter winds picked up. "In the mean time, the Foothills is a fine place to scrape out an existence. The ground is easier than the other two herds, full of more sweet grasses and clear springs than any of the wilds here. There is safety there, and as for company... I'm there." He grinned, a bit cocky with the tilt of his head and the arrogant hum to his tones. The longer she watched the stallion, the more intrigued she was by him. His emotion seemed to morph with every passing moment, though the feel of strength and solidarity that he gave off was unwavering. Surely, he must be some sort of King or God, someone whose power lended itself to the needy like herself. She had never met anyone like him, certainly not in her home-land, where she had been mostly isolated from others. Wonder fell upon her face as the gold boy murmured quietly to her, his sullen words a stark contrast to the vivacity he held only minutes before. "Then I do will it. If for nothing but to see you smile." Her lilting chords rang out confidently, though her features had softened into a look of coyness. Where the newfound integrity had come from, and why, was still a mystery, though she accepted the strange feeling of vigor easily. Gone was the mare who'd let herself be downtrodden by mutated strangers. The silver maiden's happy expression broadened along with the stallion's as he continued. She did not miss the way those chartreuse eyes gleamed mysteriously. Ricochet. She let his title settle in her mind, liking the sound of it. His words revealed that he was no King nor God, but also hinted that his dreams were not small. A different life, he said. What could he mean by that, this prince of nothing? Her own icy pools glinting with interest. "Do tell me of your empire, Ricochet." Her voice seemed to take on a coquettish air as it aimed for Ricochet's ears. His sandy body sidled closer to her own, and without hesitating, she moved in to press her own dappled, bony side against his. A shiver racked her pelt as the warmth of his body met hers, maybe not entirely from the cold. Was it Frostfall or malnourishment that let her normal caution slip? No, she felt safe with Ricochet already, for his wild openness left little to her imagination. The first invitation she'd gotten in this land was given, and it felt that it had been waiting for far too long. "There's no need to waste your breath trying to convince me. I would be honored to join your herd, Ricochet. As long as I will be able to have your company, I suppose 'scraping out an existence' won't be so bad." I have no time, am placing Ricochet in absent abyss and playing as if the Gray chased him off. At this time I cannot continue this thread, we can assume they traveled to the Foothills, but since there is no future with Ricochet heading the empire, I'm not sure if you'd like Bellatrix to stay in the Foothills, become Outcast, or maintain the empire plot regardless of Ricochet.